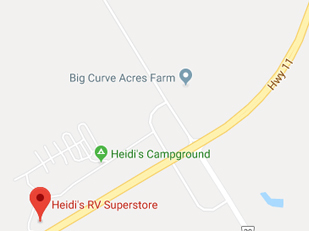 Thank you for visiting Heidi's RV Superstore! We are a multiple award winning dealership that is a nationally recognized leader in both sales and customer satisfaction. We are happy to be able to pass our unique and exclusive volume discounts directly to you. Heidi's RV Superstore only represents the highest quality products from the most respected manufacturers and suppliers in the RV industry. Heidi's RV Superstore is the perfect place to find the RV that you are looking for. You will be able to find what ever you are looking for in our massive inventory. Our helpful and friendly sales associates will be able to find you the perfect new or pre-loved RV that you were looking for. Heidi's RV Superstore is your one stop shop for all your RV needs. Come on up and join us anytime for tons of summer fun for the whole family, right here at Heidi’s Campground! Do you have a specific trailer layout in mind and want a faster way to find it? Click here and use our floor plan finder to find the the model you have been searching for.